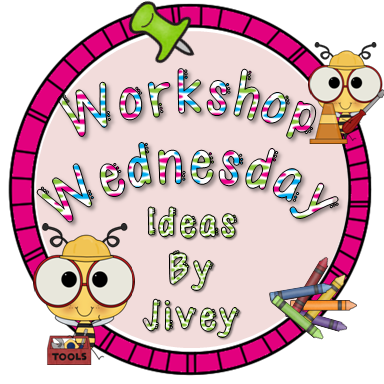 Pinkadots Elementary : Workshop Wednesday: What has worked well for me this year!? Workshop Wednesday: What has worked well for me this year!? I was excited to be able to give a shout out to a teacher blogger who has helped me out tremendously this year, while linking up with Jivey's Workshop Wednesday. I love the fact that as a pretty creative TPT seller and a hard working teacher, I am able to share what I do in the classroom and inspire others through my blog. It makes me think that all of my hard work and efforts are paying off. This not only benefits the education of my students, but students around the world. As one little small person in this ginormous world, that is pretty inspiring to me! Anyways, I need to give a huge shout out to Antonia, from Forkin 4th, for making my life SO much easier. She created this homework bundle to cover 40 weeks of school. I bought it right before school started and copied it for the YEAR. Not only does it make me organized, but it teaches my students to be organized, plan ahead, and learn responsibility. On Monday, I give my students a copy of their homework packet and it is due back on Friday. 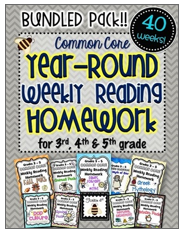 Each packet includes a nonfiction or fiction based text with three pages of reading comprehension. The reading is repeated throughout the week and read out loud to a family member. This is a great way to get the parents involved with their child's education. We also correct the packet together every Friday. The students actually enjoy this work because they like having everything given to them at once. They can plan out their busy nights knowing they have to do extra homework one night, so there is no homework on another night. This is a great way to make students learn responsibility. It also keeps consistency in my life because I give a packet EVERY week. Because of this, I do not have many students who forget or simply skip out on homework. The readings are fun too. The texts range from a biography on Bruno Mars to fictional story about Lady Gobble, a Lady Gaga obsessed Turkey. The students AND parents enjoy these every week. They are happy, which makes my life happy. So thanks Antonia for making my life easier! I am excited to see what else I can learn from Jivey's link up. Honestly though, I've gotten so many awesome ideas from my bloggy friends, and TPT has helped my teaching life, for real! The friendships, support, comments, enthusiasm, and venting I get/give to and from my online friends has made me a better, stronger, happier, and smarter person. So THANK YOU to all of my BBBs, followers, and friends! Oh...I'm excited to check out a new blog..thanks for sharing! I also own some of her individual packs and think they are great! Some of my kids struggle with the reading level so I use them with group work, but most can handle them independently. What an awesome shout out you gave Antonia! What a doll, you certainly made my day with this post!! I'm so excited to hear how successful this has been in your classroom and what a hit it has been for developing consistency and promoting student responsibility. That was my intended goal as well, knowing that we all lead such busy lives these days! I feel so honored to be mentioned in your blog and am proud to be your newest follower!